Army worms are another type of lawn pest which are commonly referred to as lawn grubs. This caterpillar of the Spodoptera mauritia moth, is most prevalent throughout the warmer months of the year, and repeat infestations can occur. The damage caused by Army Worms is most obvious by the speed at which damage occurs, as the caterpillars form very large numbers and behave as a colony to eat away at the green leaf of lawns. Army Worms can vary in colour from green to brown to black, they can reach a maximum length of about 4 cm, and will become plump as they feed and mature. These large numbers are possible due to the moth parent being able to lay up to 500 eggs in a single laying, and then repeat the same process the following night. This is where this lawn grub gets it’s name, it forms a large army, lays devastation to an area, and then will quickly move onto the next lawn once it has laid waste to yours. 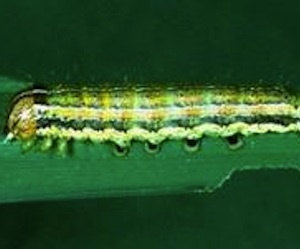 Army Worms can also attack many other types of plants and vegetables, and the key to effective treatment is to identify and kill them as early as possible. Do I have Army Worms? Army worms are very difficult to find, they spend their days hiding at soil level, and deep inside the thatch layer of the lawn. It’s at night time that Army Worms will come out and spend their entire night feeding on our lawns. For this reason, it can be difficult to actually track down these lawn grubs and pin the proper responsibility on them for the damage to our lawns. When seeing that our lawn is becoming damaged in large spread-out areas, then caterpillar damage should be considered as a possibility. Because not only could the damage be caused by Army Worms, it may also be due to another lawn grub such as Sod Webworm. There are two main methods of checking for Army Worms. The first method involves using a bucket of soapy water which has been mixed-up with dishwashing detergent. The mixture is then poured over the lawn in a small area. The area is then monitored over the next 10 minutes to check for caterpillars which are rising to the surface. The second method involves going out onto the lawn at night time. With a good torch in hand, get down low onto the lawn and carefully run the torch over it looking for caterpillars feeding or moving. Begin the search at the damaged area of turf, and spread outwards from there. Another sign of possible caterpillar infestation is to leave the outside light on at night for a few hours. Then go outside every so often and check for moths flying around the light. If a multitude of moths are present, then this may be a sign of possible lawn caterpillar problems which will require further investigation. If you do find caterpillars, it would be best to capture a few to take to the local nursery for positive identification. This will help the staff member to recommend the right insecticide for the caterpillar type. Once Army Worms have been identified, they are treated with a lawn insecticide which is freely available for purchase from garden stores and nurseries. The insecticide is mixed-up and applied to the lawn just before dusk. Ensure to allow yourself enough time to finish the entire lawn treatment before dark. The treatment is then lightly watered into the lawn so it can reach down to the base of the thatch layer. 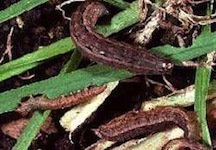 The poison is then ingested by the Army Worms as they are feeding on the lawn. Be careful not to over water, this will simply wash the poison away, and it will not be ingested by the caterpillars. 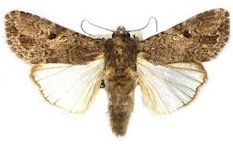 The life cycle of the Army Worm, and it’s Moth parent, is very rapid, and as such it is possible that three different infestations can occur over the warmer months of the year. Be aware that this is a possibility, and if the same symptoms do re-occur then the same process of identification and treatment should be repeated as soon as possible, and when necessary. Army Worms will not generally kill a lawn by it’s feeding, but it will become heavily damaged, which if left untreated could cause patches of lawn to die. The only real thing to do at this time is to follow good lawn care practices and apply a quality fertiliser, and ensure it is getting adequate water. This will allow the lawn to best repair itself. There is no need to over-water or apply excess fertiliser, doing either will not aid the lawn in repair, but may even cause further damage. Always apply fertilisers at manufacturer’s recommendations.